You might call BioShock 2 'BioShock with the top down'. You'll discover this early in the game, when its lid, sides, and bottom suddenly disengage and you're thrust beyond the safety of purpose-made geometry. 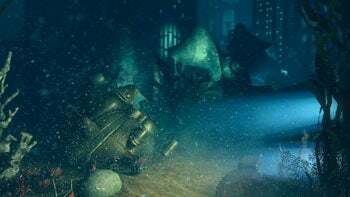 In BioShock, Rapture was a nightmare metropolis beneath the sea, an abyssal macro-terrarium circumscribed by an ocean unwittingly intruded upon, but for all the rifting city's dribbling cracks and spitting leaks, the ocean never came to you. In BioShock 2, Rapture's reinforced glass and metal edges are only a measure of protection, a measure the design team seems fond of occasionally snapping out of true. Thank goodness you play a creature with proper accoutrements. The original's iconic renders of hulking creatures in monstrous diving suits with lighthouse-yellow blazing from their helmets? You're one of them this time, a Big Daddy, and instead of glimpsing them through bleary windows trundling along Rapture's perimeters, you'll follow in their footsteps through forests of coral, crabs, snails, and algae. That said, the game still feels like BioShock, from its bold electroluminescent billboards and placards to the frenzied prophetic scribblings of the mad adorning random walls. 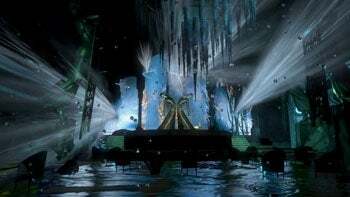 I don't generally obssess over visuals in games, polygons and textures and such, but BioShock was a uniquely visuals-driven game. The original gambled as much on its aural and ocular atmosphere as its supernatural arsenal and elaborate enemy ecology. Without Rapture, silent and backgrounding and intricately stylized, you'd lose most of what makes BioShock BioShock. Without compromising that style, BioShock 2 evolves Rapture's creepy neon and refracted-light-lit art deco chambers by shedding some of the caricature. Rapture's denizens look less like glass-eyed wax mannequins and more like human beings this time. The little sisters--the original's cruelly diminished waifs with anime eyes--are more like actual little girls. Their smiling faces seem more physiologically plausible, and in light of what's occurring in the story, that much more tragic. The world itself seems sharper and bleaker, too, viewed through a camera more confidently in focus, angling over a palette composed of deeper hues and higher contrasts suffusing even creepier architecture. Some of BioShock's mechanical problems have been addressed off the block as well. "BioShock had problems?" Sure it did. The vita chambers for starters. Each time you died, you'd teleport back to the most recently visited lightning-filled cylinder and emerge good as new. Your enemies operated without this particular luxury. The lure of instant and priceless rejuvenation encouraged tactical sloppiness, not to mention casting things in a brutally lopsided light: Why were you the only inhabitant of Rapture who could use them? In Bioshock 2, the vita chambers are back, but can be disabled in the option menu (as per this feature's introduction to the original in a post-release update). Your enemies still can't use them, but at least you can switch them off if you'd rather rely on judicial saving, tactical forethought, and ballistic execution. Another issue I didn't remember being one until I (recently) replayed the original was that its hacking mini-game gets old early on. Sure, you grappled with incremental blocks of health-sapping zaps and deadly security alarms, and the burbling aquamarine fluid flowed faster (somewhat arbitrarily) as you advanced through the city, but the underlying play hooks never evolved to keep you riveted. Toward the end of my last go, I tossed frugality out the porthole and stockpiled auto-hack guns. Call me impatient (or maybe just lazy) but invoking the hack interface and fussing with the connector pieces while the rest of the game ratcheted up dramatically was pure buzzkill. In BioShock 2, the pipe-and-fluid bits are gone, supplanted by timed button presses on a handheld hack tool you can use up close or fire, dart-like, from a distance. Stand beside a healing station, vending machine, or security camera, tap to hack, and you'll view a needle ticking like a metronome over bands of color. You're supposed to tap when the needle traverses a 'green' zone to succeed. With easier-to-hack devices, you may only have to tap once to succeed. At high complexity, the first tap brings up a second set of colors, these more narrow than the last, giving you less time to tap when the needle's in the zone. The upside is that hacking takes seconds instead of half a minute or more, keeping you in the moment, be it sedate or frenzied. The downside, depending on how this evolves through the game, is that hacking's almost too easy. That, and where BioShock's tubular connectors offered the pretense of fooling with a device's internal mechanics, tapping buttons on a handheld galvanometer feels a trifle gamey. Otherwise I'm relieved, leaning toward impressed so far. The story seems as poised to wrestle intelligently with the perils of hive collectivism as the original with unfettered capitalism and psychological egoism. The actors handling the voices for the audio logs are as convincing as they were in the original. The characters still feel like clichés (the contrite mad scientist, the sanctimonious ideologue, the slick-talking tycoon) but that's how comic-book storytelling works: Pathos by way of theatrical starkness, and characters who don't just act their ideologies but are their ideologies. BioShock 2 dials the theater back slightly, perhaps enough to humanize the game in ways the original failed to. The initial plot hook seems promising enough: A father's quest to find his daughter. To be honest, I find that more compelling than the original's Lost-like plane crashes and rigged survivor quests and emotionally flat lineal reveals.